Squashes are versatile, long-keeping, and delicious. This clever curcurbit produces a hard rind that keeps it beautifully for months after harvesting. For this reason, it’s a great idea to grow or buy plenty when they’re available in the autumn. Put in a cool, dry place, away from humidity or frost, and your squashes will keep right through to spring. But what can you do with them between now and then? Preparing squash for cooking is the hardest part of any recipe. You’ll need a sharp knife and a big one for large squashes. Start by cutting the squash into half, then quarter, then wedges. These are easier to peel – using a sharp knife or, if the skin is not too thick, an ordinary vegetable peeler. Finally, use a knife or spoon to remove the seeds and fibrous flesh. If you put the seeds into a sieve and rinse them off, you can roast them in the oven to make a crunchy snack (pepitas). Seeds put into compost are likely to grow in your garden when you spread the compost in spring! At SeasonalFoodRecipes we love growing and cooking with squashes. Although the Butternut is most widely available, there are some other great types at farmer’s markets and allotments. 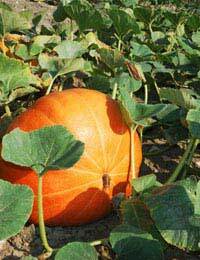 Try to avoid the gigantic, watery pumpkins – choose crown prince, Queensland blue, or red kuri. All three are sweet and firm, suitable for roasting or soups. Here are two of our favourite ways of cooking squash. Roasted squash is a superb accompaniment to roast meats, kebabs and burgers. Oven-roasting intensifies the sweetness and produces crunchy edges. Peel the squash and remove the seeds and fibres. Then cut the quarters into wedges of an even size – about 1cm at the widest point – and put into a freezer bag. Drizzle in enough olive oil to coat, then sprinkle in 1-2 tablespoons uncooked polenta and 1-3 teaspoons chilli powder (depending how hot you like it – and you could swap this for paprika if preferred), plus salt and pepper. Shake the bag gently to cover the squash with the spices. Heat the oven to 180 degrees C, gas mark 4 and put in a sturdy baking tray to heat up. When it’s hot, tip the wedges onto the tray and bake for 30-45 minutes, or until the wedges are golden and tender. Serve with salsa or sour cream for dipping. Cut your squash into large (5cm thick) wedges, and remove the seeds but don’t peel. Roast in a 160 degree C, gas mark 2 and 1/2, oven for about 30 minutes or until tender right through. Leave to cool. Now scoop the flesh into a weighing scales – you want about 550g. Mash it well with a fork. To this add the beaten egg, 25g finely grated parmesan (or pecorino, which is a bit cheaper and just as good) and the flour. Season fairly generously with salt and lots of black pepper. Stir it all together to make a dough, then put it into the fridge for half an hour to rest. Roll the dough into balls the size of walnuts and dust with flour. When ready to cook, bring a large pan of water to a rolling boil. In a frying pan, melt the butter and add the sage leaves (and truffle oil, if using); once the butter is bubbling, keep on a low heat. Cook a few of the gnocchi in the hot water at a time – drop them in gently without stirring. As they rise to the surface, scoop them out and drop them into the pan of butter. Once they are all cooked and in the pan, shake it gently to coat the dumplings in butter, then serve on hot plates or bowls. Sprinkle with extra cheese to serve.